I guess you can assume a campaign is working when exposure to a brand influences your dreams. I dreamt the other night that I was at war with a friend over the benefits of Nedbank versus ABSA. Huh? I know, maybe I need to get out more, or drink more, or something. Anyhoo, Jozi dwellers will have noticed Nedbank Capital’s new Greening The CBD solar-powered robots around Sandton and the surrounds. 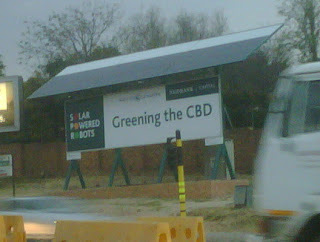 This solar-powered billboard punting Nedbank’s extra green status caught my eye [and nearly caused an accident] and reminded me of an article I read recently written by Gary Harwood of HKLM fame. Make The Message Mean Something is about building bus shelters instead of billboards, about marketers taking responsibility for ensuring the power and influence brands possess is applied across society and the community in a positive way. I love this mantra and hope that brand managers and marketeers the world over realise the value in brand karma and keeping goodness at the core. I must confess that although my initial response to Nedbank Capital’s campaign was a positive one, I then immediately wondered “are these things really powering the robots they promise to?”.You’ll be pleased to know that all is green, good, and in fact pretty damn impressive – read Nedbank Capital’s official press release here.